Why won’t North Carolina leaders think long-term? Governor Cooper announced a clear vision for where North Carolina should aim: one of the top 10 most educated states in the country, an attractive place for people and business, and a state that supports the health and well-being of all residents. Thinking long-term isn’t the norm for many leaders in North Carolina. Many argue that it’s the nature of elected officials to think in terms of their next election cycle. That may be part of the answer, but a very practical issue exists in North Carolina: We literally can’t afford to think long-term. 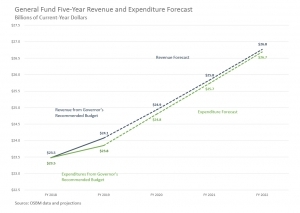 Included with the Governor’s recommended biennial budget that was released last week is a chart that projects out the state’s revenue and anticipated expenditures over the next five years. The chart provides a troubling picture of just how close we are budgeting, even as we fail to meet all our existing needs. By 2021, revenue collections for North Carolina are anticipated to be $100.7 million above anticipated expenditures. These anticipated expenditures account for enrollment growth in public schools and Medicaid, costs of maintaining capital investments, paying debt obligations and maintaining a commitment to get teacher pay to the national average. Notably, the projections highlighted in the chart do not anticipate any new needs that could arise in the years ahead. So, for example, if the federal government retreats from its commitment to provide health care to the most vulnerable, North Carolina would be not be in a position to fund health care services for vulnerable North Carolinians. If North Carolina wants to enhance our economic development strategies to ensure that capital is available to small businesses or target deeper engagement with communities of color, we as a state would not be in a position to meet these ambitions. As North Carolina simply seeks to help rebuild Eastern North Carolina after Hurricane Matthew at the same level of commitment that was provided to that region after Hurricane Floyd, our existing state tax code couldn’t meet that need. Proponents of tax cuts for the wealthy and profitable corporations like to point out that, unlike Kansas, North Carolina did it right. However, our policymakers chose to slash public services to make up for the lost $2 billion that couldn’t be made up by shifting the tax load onto middle- and low-income taxpayers. This was an effort to make the state budget look structurally sound in the wake of costly tax cuts. And it will be, on paper, through the next five years. The pressing issue that North Carolina now faces, however, is that our state tax code will continue to fail to serve its primary purpose: to fund the needs of a growing state and to be a leader in the nation for attracting and retaining businesses and delivering a high quality of life to all.